Dishin’ Up the Soap – Find You in the Sun – A daughter's slow waltz with her mother's dementia. The Soap Saga – Part Two. For Part One, click here. “Young lady, if you’re lying to me, I’m gonna wash your mouth out with soap,” my mother clamored. I was ten, and swearing on the Bible had not been enough to convince my mother I wasn’t lying about where I had been. I wanted to ask if she planned to use Ivory, Dial. Or, would she choose Saddle soap, which no self-respecting shoe store family goes without. Or, Mom’s selection could include the dreaded Fels Naptha, which I had used a fair share in my short life to fight off the unrelenting itch of poison ivy. Regardless, my mouth still received a hardy cleansing. Her choice? Ivory, of course. That memory came to me, as I watched Mom, now eight-eight, lie restless in a hospital bed, hands restrained, lips and throat swelling rapidly. During my rushed drive, I couldn’t push away the memory of Mom washing out my mouth. Finally in the ER, when the doctor asked Mom to open wide and say, “Ahhh,” I swear I saw bubbles forming in the back of her mouth. Sure, that’s sounded exactly like something I wanted to do. Make my mother angrier than she already was. Nevertheless, I snapped on latex gloves and poked around in her mouth, clearing out a few white bits that, yes, actually resembled soap. Then, she bit down. Hard. One medical expert remained adamant. “Soap wouldn’t do this.” He meant soap wouldn’t be responsible for such a severe reaction that Mom would not respond to standard medical protocol of Benadryl or steroids. I repeated the story to the ENT, the pharmacist, the nurses and residents on ICU, the caregivers at Arden Courts, family and friends. And then I needed a respite and couldn’t resist. I joked how Mom used to wash our mouths out with soap if we lied or used swear words. Friends thought I was kidding. Then, I recalled how Mom, as of late, had taken to cussing a bit more than usual. Her crankiness level was directly attributed to how often she could get outside. Spring rains had become summer pours. August’s simmering heart had arrived in June. Her forays outside were limited and that often caused consternation on her part, thus leading to a few choice words being shared if Mom didn’t like the direction her life was taking in that moment. She had been holding on to the soap, in case the doctors had wanted a sample to test. I was informed that might have cost thousands of dollars to determine any cause or effect. The doctors rejected my gift. I brought the soap home and untangled it from the plastic garbage bag. The bar was of the Motel Six variety shape and scent, nondescript. I turned it over and over in my hands and ran my fingers across the indentations. That was a quality bite, as good a mold as was necessary for dentures. No wonder why the doctors were challenged in believing me. Mom should have broken a few teeth after that kind of bite. “Yes, she does,” I had to agree. Finally, after two weeks of ensuring Mom had returned to her normal appetite, mobility and snappiness, I saw how effective soap could be in cleansing my conscience. Mom really did wash out our mouths, questioning our honesty. But if I had to tell the truth now, with the threat of Fels Naptha soap hanging over me, there were just as many times we lied. As precaution, when bringing gifts or items to a loved one, check with the administrator or caregivers first. They will know if their residents are capable of discerning the danger of an item. Recognize that your loved one will ingest items that you couldn’t possibly imagine. Mom has eaten a Styrofoam Easter egg from an artificial flower basket. She has also been known to gnaw at whole onions. The easiest way to stay clean is to tell the truth. 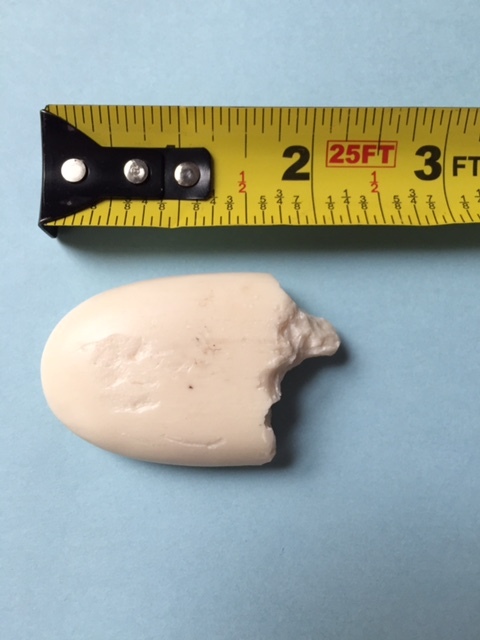 That’s an impressive chunk of soap! Love your “lessons learned” section. #3 rules! Once again you’ve nailed it, capturing with such clarity the saga. Mom had her purse initially, which we inventoried several times a day. The maintenance man gave her a straight pin like rod to open her bedroom door (which did not lock). One evening when she was insisting on leaving and not happy with me for not helping she tried to shank me with it! I’m happy your mom recovered from the scare. Thanks for documenting the journey. It’s beautiful and therapeutic. ..
Tim – Your stories are just as poignant and funny. I hope we both find healing in sharing….